“This is a deep mystery from thousands of years ago. So often we suffer from Euro-centrism in our school text books,” said Texas Poet Laureate, Dr. Carmen Tafolla. She drove from San Antonio to hear noted Valley author and scholar David Bowles share passages from his latest book, “Feathered Serpent, Dark Heart of Sky: Myths of Mexico.” “This is important research he has conducted into our early heritage,” Dr. Tafolla said. 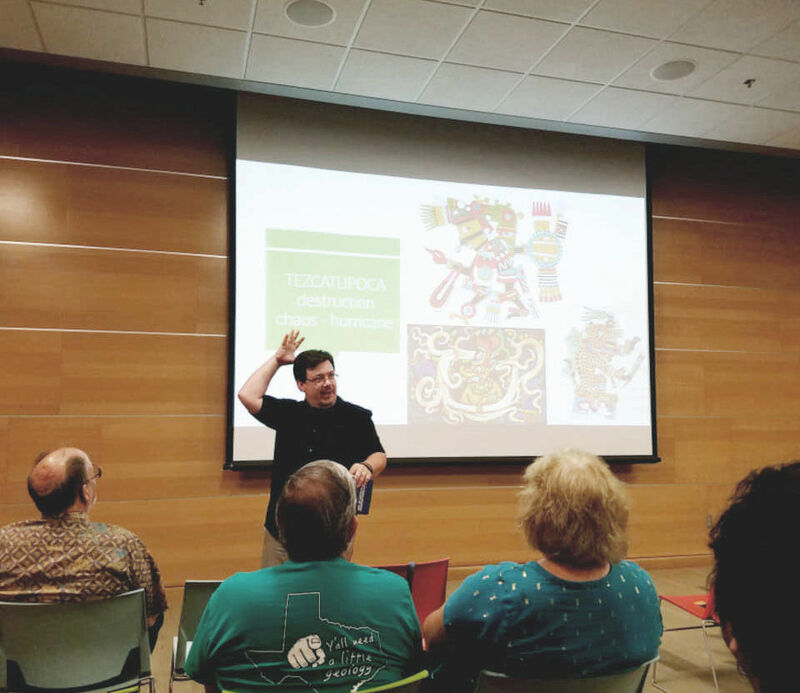 About 100 McAllen Public Library patrons attended Bowles’ two-hour lecture Friday night, detailing the development of ancient myths, legends and supernatural beings. Bowles recounts the story as the enraptured crowd listens. “I will bring you fire but you must take better care of it this time,” states the godly marsupial. Mankind hangs its head in shame and agrees. Local author David Bowles speaks at the McAllen Public Library Friday evening about ancient Mexico. Bowles began his research into the myths of ancient Mexico as a way of connecting with his Mexican heritage. He says, as a student he began to scour local libraries for every book he could find about pre-Colombian Mexican myths. Bowles describes his book as beginning with the Mexican mythology surrounding the creation of the Earth and ending with the Spanish conquest. “So when you get to the end of it, it’s kind of a bummer. Everything is crumbling, the Spanish are winning, people are dying from disease, people are being slaughtered,” Bowles told the crowd. “So I decided to end the book with the rise of the Mexican-American people — the Chicanos.” As a result, he sees his work as a “bittersweet” tale. The gods of Mexican antiquity are not engaged in a battle between good and evil, as in Greek mythology, but rather strike a balance between chaos and order. The beginning of the world is the result of the dreams of Ometeotl, known as the “dual god,” a god that is both male and female and representing chaos and disorder. In its dream, the god imagines the world is populated by multi-faceted creatures. “Each unique and each beautiful,” said Bowles. But the god becomes so obsessed with its dream that it splits itself in half and becomes two gods. “They begin to create the universe, bit by bit,” Bowles said. Thus the story of the universe begins. Bowles concluded his lecture with a brief question-and-answer period. Then the crowd shuffled out, but many remained to buy his book and ask the author a few last minute questions. George Diaz remained after the lecture to share his thoughts with other library patrons. He attended the event because he is familiar with Bowle’s prior books on Valley culture. Diaz wanted to learn more about Mexican mythology. Few people remained as Bowles gathered his notes and prepared to leave the library. He described the lecture as a success and “full of energy.” His appearance at the McAllen Public Library was the culmination of a two month book tour, taking him to states such as “Virginia, North Carolina, and all over Texas,” Bowles said. He points out his message is important, given the current political climate affecting recent immigrants from Mexico and Central American countries. “In these times when brown people and indigenous people are being looked down upon and pushed aside, we should be looking out for them and protecting them and working alongside them,” said Bowles. 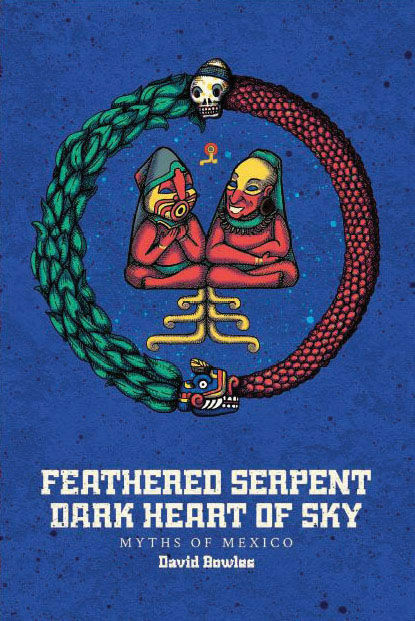 “Feathered Serpent, Dark Heart of Sky: Myths of Mexico” is currently available on Amazon.com. Bowles is also the author of “Ghosts of the Rio Grande Valley.” He was inducted into the Texas Institute of Letters in 2017.